Just all the photos from here sta.sh/21dle5xg1tf5 put into pdf form for easier downloading. You do a great work! Maybe when my life isn't bogging me down with homework I can try this I really want to, but I dunno if I've got the patience, haha. Thanks! If I ever do I'll definitely show you (if it doesn't look like a pile of beads)! The first one I made looked weird too XD It's really much easier the second time, when you already know what you are doing. I'm going to make a better one as soon as I get the beads. Thanks again for sharing the making process, it was my beading dream to make one of these beauties. Absolutely amazing work. How big is this piece approximately? Thank you, so much, for sharing your know how. I've always wanted to make a little dragon for each of my boys (one that they'll like!). Because of your generosity, I can now do so. I can't way to surprise them! Thanks again. Ok question. When you start adding the beads for the head how do you get them to stay put? Every time I think I have it those little suckers go every way but the right way. Hm... Which step exactly is that? It's the first few beads as soon as I start the head. What stitch am I suppose to be using on the head? It's a ndebele (herringbone) tube. Try asking friends, around craft/hobby stores in your town, or find an internet store? 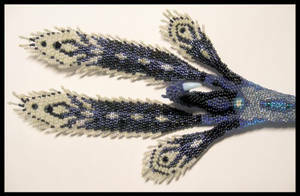 Try GJ Beads or Stitchncraft - you want to look for miyuki seed beads is size 15, 11 and 8 - stitchncraft have all of these. GJ has them too. They have online stores (google) and physical stores too. Stitchncraft are amazing and based in Dorset. Great service and I've always had fast delivery from both them and GJ beads. Your tutorial has been featured in my weekly journal: Tutorial Tuesday #23! this looks like so much fun I can't wait to try this!!!! 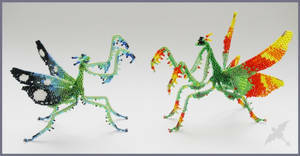 thank you so much for sharing the process of how to make these wonderful dragons they are so cute!!!!! thank you very much!!!! 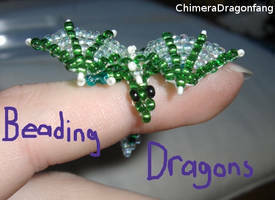 I well need it I just started getting into beading, but these are just so epic I must try my hand at making them!!!! thank you again for sharing! oh neato - this looks helpful. got the beads but never actually started - its still on my to do list!